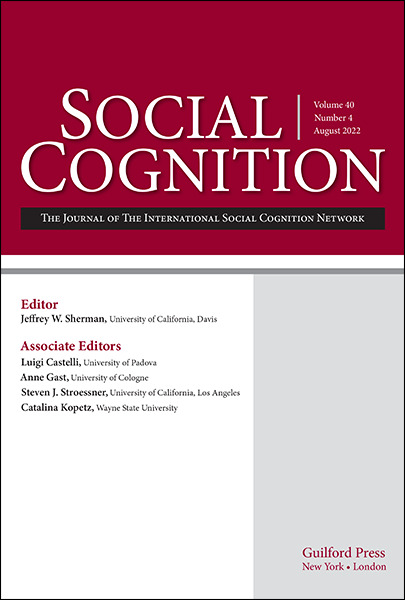 A subscription is included with membership in International Social Cognition Network. Submit your manuscripts to Social Cognition with our online manuscript submissions portal. Social Cognition Back Volume Digital Archives are now available. Get unlimited access to seminal cognitive research from Vol. 1 (1982) - Vol. 18 (2000) as well as searchability by title, author, or keyword across all archives. Individuals can purchase the full archives. Contact us for Institutional pricing. "This significant journal is one of the most prominent places where ideas in social psychology and cognitive psychology are brought together in truly creative ways." "Over many years Social Cognition has provided a compelling complement to other leading journals in social and personality psychology. Known for publishing provocative and innovative contributions that both advance the field and uphold a high standard of empirical rigor, Social Cognition plays an invaluable role in our science."